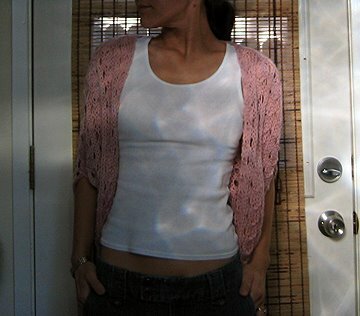 For my second FO, I started out knitting the Amanda wrap on dailyknitter.com, but decided in the initial knitting stages to convert it to a more wearable shrug. So I tinkered around a bit, took the stitch pattern of the Amanda, the schematic of Berocco's Rena shrug, plotted out the calculations in Excel (I'm a huge dork that way), skipped the whole gauge part, did some lucky guessing, and dove right in. Now I *almost* frogged and abandoned this wip about 1/3 of the way through, because the pattern had become seriously monotonous. Props once again to Stacy for convincing me to stick with it! I am SO glad I did, because the shrug turned out absolutely fantastic! Knit flat, the pattern is large and open, making it an excellent wearable for fluctuating office temps (why is it office buildings only have two settings - tropical jungle and meat locker?). Just two short seams to finish. Not necessarily fast or fun, but a simple pattern, good for those times you need some mindless knitting to work on. The cashmerino is a nice, soft yarn that - hooray! - doesn't turn my uber-sensitive skin into the itchy and scratchy show. This however, may be due in part to the open pattern. Whatever, I'm not complaining! Lesson learned: Monotony can yield magic and ask a friend before you frog!